So I'll say this right now: Jake Owen frustrates the absolute hell out of me. And unlike most of the indie country scene, I'd argue it's not because he's a bad artist, but more how he's never quite lived up to his potential in a consistent way. You have an artist who is easily one of the most charismatic act working in country, with a warmth and good-natured openness that's incredibly charming, and on every album he'll deliver at least a handful of deep cuts that are genuinely fantastic - in multiple years where he's put out projects that are incredibly uneven, he's still nabbed slots on my year-end lists! So I can't dismiss his presence in country... but at the same time, despite being an act who seemed to comfortably survive the bro-country era better than so many peers, I'm left with the feeling that his albums should be much better than they are. Part of this I blame on Joey Moi's overblown production, but a bigger factor just seems to be a pileup of silly or uneven ideas that miss as often as they hit, which you can likely blame on Jake Owen's lack of personal writing credits. And on this album, it seemed to be more of the same. I did appreciate how much Owen had tried to embrace Shane McAnally and Ross Copperman on production on his 2016 album American Love, but thanks to some poor single choices, it likely didn't hit the way it should have, and he was back to Joey Moi for this project on the new label Big Loud Records. But what worried me more was the guest stars: I know that Jake Owen is more open to sounds outside of what would be expected in country, but was it worth getting Kid Rock and Lele Pons on this? And with more cowriters than ever... look, even from what I know with Jake Owen, I was preparing for disaster - so what did find on Greetings From... Jake? Well, I have to give credit to Jake Owen... because this is not a disaster at all. In fact, probably the best way to describe this album is, 'Well, it's a Jake Owen album - lightweight, breezy, laid-back, more for cultivating a chill, friendly vibe coasting on charisma than delivering a ton of substance... until the deep cuts reveal all the quality that seldom if ever hits the radio'. And again, that makes for another frustrating Jake Owen project, because while I do think this project is probably more tonally consistent than his past two albums, I'd struggle to say it has the home run moments like the hot streak he delivered in the opening of Days Of Gold or the deep cut stunners of American Love. So yes, it's better than I expected and actually pretty good overall... but I'd struggle to precisely call it great, which at this point is starting to get exasperating. But before we get into why, I'm going to make two statements that'll probably shock some people, and the first should be no surprise: in the subgenre that is bro-country, I've always held Jake Owen to be in the upper tier if only because of warmth and natural charisma, and for my second point, even if he didn't have the best of words for the sound at the time, I'd argue he did it better than most because the writing took chances and even got mildly subversive at spots, with 'Life Of The Party' being the biggest example. More importantly, it gave the songs a sense of drama and verve that played to other facets of his personality, which gave him a chance to show off his range. Whereas here, there's a relaxed mellowness which is very much in Owen's comfort zone and lends the album a consistent tone... but it feels one-dimensional, playing to a sound where even Kenny Chesney is punching higher these days. And sure, this might fit as a loose, upbeat party record, but it's hard not to think that it limits his appeal. I will say that he and his team did manage to wrangle better than expected performances from Kid Rock and Lele Pons, with neither song being a highlight, but neither an outright catastrophe either. 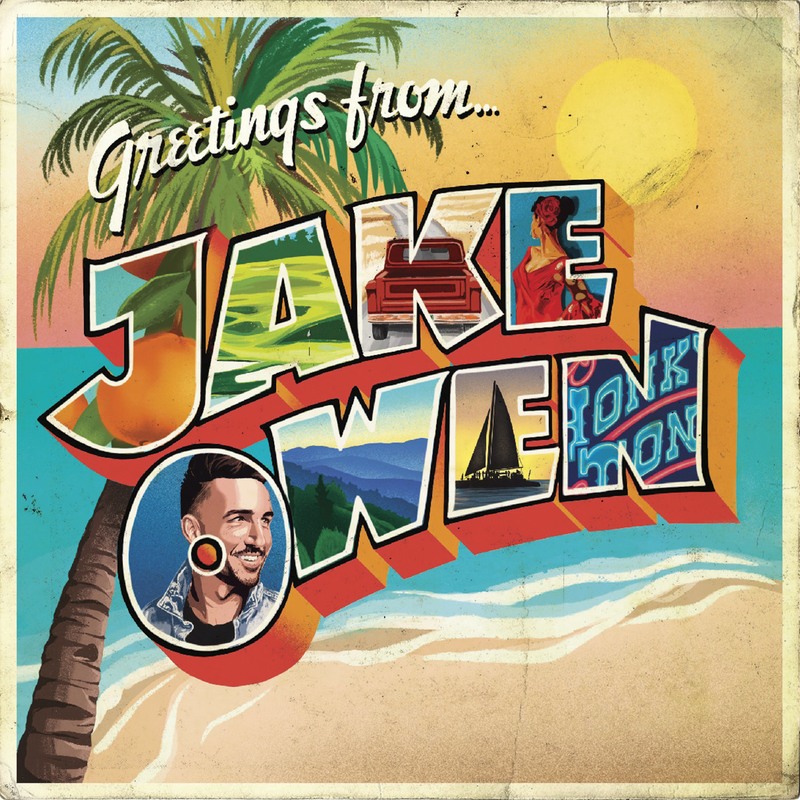 And what I think definitely helps this album is - much to my astonishment - most of the production, and this is where it looks like Jake Owen seems to have taken the most cues in recognizing how country is starting to swivel back to more organic tones. Yeah, Joey Moi manages to cram in more drum machines and questionable guitar tones than he should - that honking tone across 'Catch A Cold One', the oily tone drizzled across 'That's On Me' that doesn't really have the body it should - but there are fewer than I expected and in comparison to the overproduced grooves that Moi has delivered in the past, there's definitely a more organic sound on display. Of course, that can lead to moments like the obvious Mellencamp interpolation of 'Jack & Diane' - which doesn't rise to the heights of the original, mostly because of the half-rap cadence on the verses - and that doesn't mean this project is close to subtle, especially given some of the broader grooves on songs like 'Down To The Honkytonk' or the whistle driven 'Grass Is Always Green' or the blatant island feel of 'Drink All Day'. But the melodies are more prominent, the guitars carry a lot of organic warmth, there's a fair amount of pedal steel, and while this album doesn't really slow down until the final third, I do appreciate that Jake Owen really didn't bother with the plays towards R&B or try for a brand of cool that feels unnatural. Hell, the closest in that category is 'Senorita' with that fizzy drum machine and very crisp vocal layering, but even that one seems to fit more with the prominent acoustic grooves and might have one of the best hooks on the entire project! And again, when Jake Owen lets himself slow down and digs into his subtler, more atmospheric tones, we get great moments: the gentle acoustics and pedal steel filling up the background on 'In It', the more bare-bones storytelling of 'Made For You' playing off traces of organ, and the wave-touched 'Mexico On My Mind' - hell, while the lyrical sentiment is goofy, 'Damn' brings in some traces of saloon piano, organ, and fuzzier guitars for a straightforward rock-tinged country tune that's a surprisingly effective closer. But now we have to talk about content... and really, while Jake Owen's had lyrical misfires before, this is the sort of project that doesn't really give me much to talk about, mostly because at its most it's just kind of corny or forgettable. And it's very telling that four of the five songs from his 2018 EP wound up here and lose a little weight in comparison with the larger project - the faint, wistful memories of 'I Was Jack (You Were Diane)', the goofball vibe of 'Down To The Honkytonk', and especially the undercooked platitudes of 'Catch A Cold One'. And there's a similar brand of disposability to the blatant weed reference of 'Grass Is Always Greener' or the obviously titled 'Drink All Day', and even to 'Home Made', which I thought hit with way more impact on 'American Country Love Song' a few years ago - ironic, because somehow I wound up finding more flavour and chemistry to the hookup of 'Senorita'! But again, by the time we get to the final third of the project, we get the songs with lyrical impact: 'River Of Time' might be a pretty breezy 'life as it passes' tune, but it actually fits with Jake Owen's natural demeanor and approach to life, although it's kind of superseded by a similar if more abstract arc on the love song 'Made For You'. And honestly, that wistful hopefulness is one reason why Jake Owen's more downbeat songs have real impact - this is something I noticed with 'L.A.X' and is just as true here on songs like 'Mexico In Our Minds', where the unanswered subtext in this love song is why they don't just go, and all the thoughts that spring from that makes the song more interesting. And I really love how Jake Owen brings real maturity to the breakup song 'In It' - he's clearly not over her, but he's not about to force something that's not working, so he takes the high road and only wishes that she might remember a bit of him along the way in her story; a similar arc to 'L.A.X. ', but a really damn good one. So as a whole... okay, look, I think it might be easier to praise this project as better than it is, or for what it doesn't do in comparison to what it does... but I also can't deny that in comparison to American Love it does feel more consistent in production, there's more great songs and less bad ones. I won't say it's better than Days Of Gold - there's more forward momentum and punch on that project than he gets credit - but I can argue this is a focused step in a good direction overall, which is why I'm giving this a light 7/10 and a recommendation. If you're looking for a well-timed spring and summer album, give this a try - fun stuff.